It is interesting the peculiarities of shops in different parts of the world. In Japan they play music at you when they are going to close, you get about 15 minutes warning. And quite often they will play Auld Lang Syne. At night most of the local Summit closes, the food section stays open. Summit is like a Kmart, a supermarket and a 2 dollar shop combined into one store. Since most of the shop has closed they close and lock all but one set of the entrance doors. Putting a sign behind the one not open, so you don’t try to use them. 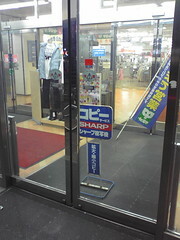 The night this photo was taken they put the sign advertising their Sharp コピー (copy) centre sign out. This entry was posted in Photos, Travel and tagged closed, Japan, sharp, Tokyo. Bookmark the permalink.